FIPA GmbH (www.fipa.com) developed a customised handling solution to make the workplace more ergonomic and provide increased productivity for Krieger Treppen GmbH. The handling solution is based on the FIPALIFT Expert, which was adjusted to the task by using FIPA gripper and vacuum components. Staircase construction, restoration, and renovation - Krieger Treppen GmbH from Traben-Trarbach has been working for more than 50 years in this demanding segment of the woodworking craft. Its focus is on the customised production of high-quality stairs made of solid wood. The starting material is up to 160 kg rough sawn wooden planks directly from the sawmill. During production, the wooden planks must be frequently moved by muscle power - a process that takes a lot of power and up to two employees to complete. 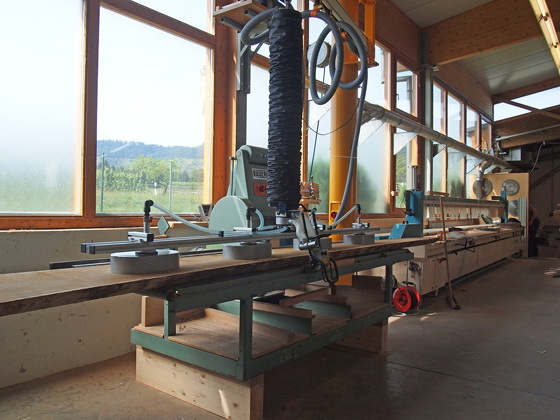 While looking for a solution for the strength-saving handling of wooden planks by only one employee, they turned to FIPA. The handling solution should be affordable for medium-sized businesses and increase the efficiency of staircase production. The long experience of FIPA GmbH in gripper assembly and vacuum technology as well as their high level of competence in lifting and crane technology were decisive for the contract for the development of a tailor-made solution based on the FIPALIFT Expert tube lifter. The condition of the wooden planks that were heavily rough-cut, uneven, of different lengths, and partially covered with core cracks presented a challenge for finding solutions. Added to this was an unevenly distributed center of gravity. The combination of the FIPALIFT Expert vacuum tube lifter and a customised vacuum traverse proved to be the best handling solution. The 3 m long special traverse with four movable vacuum cups can be easily adjusted to the various plank lengths. The sealing foam of the vacuum cups compensates for the unevenness of the plank surfaces. Leaks are thus kept to an absolute minimum. Components from the FIPA gripper assembly kit were used for the construction of this special traverse. After commissioning, it quickly became apparent that the customised lifting solution relieves the employees of strenuous work and increases the efficiency of the staircase production. The application shows an example of how the compatibility of almost all the components of the FIPA vacuum and gripper technology facilitate the development of customised FIPALIFT tube lifters. With years of experience, our own design team and the comprehensive range of standardised components from vacuum, gripper, crane and hoist technology, FIPA can develop special solutions inexpensively and offer them at competitive prices.